Renewable energy has become an important part of the global energy mix. This can be celebrated as a great achievement in the fight against climate change, but difficult questions still need to be asked about its squeaky-clean image. The current discourse on renewable energy tends to centre on the positive reduction of greenhouse gas emissions and improved energy security, while the risks of social and environmental injustice are largely ignored. As with any development, it is important that the introduction and use of new low-carbon and renewable energy technologies avoids such negative impacts and creates meaningful economic opportunities for the communities around them. Thanks to large-scale investments in geothermal and wind projects, Kenya has become an important renewable-energy hub on the continent. The country has a cautionary tale to tell. Wind energy is widely cited as the fastest growing source of energy in the world today, but its development has also proven controversial. It is of course true that wind turbines do not emit carbon dioxide or other greenhouse gases, but this should not excuse a lack of community engagement and inclusion in the development process. For most people, wind turbines have been sprouting up on the horizon, but others have them right in their backyard. In Kenya’s Rift Valley, Africa’s largest wind farm is set to provide 310MW to the national grid, but has raised concerns about negative impacts on local communities. The Lake Turkana Wind Power Project is located in Marsabit County, on the eastern shores of Lake Turkana, on land used by Rendille, Turkana and Samburu pastoralists for pasture and water. While the land has not been fenced, security personnel regularly question the herders about their movements. The process by which the land was leased to project developers is also highly controversial. In an area where communities are already grappling with decreased grazing land due to climate change and other developments, no public consultation took place, and neither did anyone receive compensation for the loss of land use. Initially, 40 000 acres were allocated for the project. This expanded to 87 000 acres in 2012 and to 150 000 acres in 2014. The annual lease price? A mere USD3000 per annum. Community members from Marsabit County are now contesting the lease process in court. The Constitution of Kenya recognizes community land rights under Article 63, which states that “community land shall vest in and be held by communities identified on the basis of ethnicity, culture or similar community of interest”. The definition of community land includes land that is “lawfully held, managed or used by specific communities as community forests, grazing areas or shrines; ancestral lands and lands traditionally occupied by hunter-gatherer communities; or lawfully held as trust land by the county government”. The land in the project area is classified as community land that is held in trust by the county government on behalf of the communities. However, it is clear that the county government entered into agreements without adequately consulting those communities. National and international laws and policies, including Principle 18 of the UN Guiding Principles on Business and Human Rights, equally require corporations to pursue meaningful consultations, in good faith, with potentially affected groups and other relevant stakeholders. With indigenous peoples, consultations should lead to the free, prior and informed consent (FPIC) of the communities. The consultations should be undertaken in culturally appropriate ways that include community decision-making structures, language and gender dynamics. All these concepts were ignored by the wind-farm developers who deny the presence of indigenous communities within proximity of the project. The local community was not given an early, open and transparent public engagement process to have a real voice in this development. “Benefits” are given out at the discretion of the company in form of corporate social responsibility (CSR) interventions that often comprise social services that should have been provided by government in the first place. Ironically, this does not even include the provision of electricity, as the communities are not connected to the grid that the wind-farm project feeds into. Instead of trying to “bribe” the community with CSR handouts, the company should deliberate with the community for a Community Development Agreement (CDA) as a guide for benefits. Moreover, as if all this was not enough to deal with, Kenyans do not even know the cost of the power that the national government has signed a guarantee for. Public debt is increasing but the entire project is shrouded in controversy and secrecy. Of course, there is a real need to reduce carbon emissions quickly to avert planetary disaster, but as the development of renewable energy shifts into top gear, the growing evidence of a lack of social conscience reveals the dark side of “green” development. These projects, built in the name of the public good, need to deliver tangible benefits to local residents and not just dump externalised costs on them. Development should not leave behind those who are already marginalised. In this context, the decentralisation of green energy – including community ownership and not just handouts – becomes more important than ever. A critical look at the upstream value chain is equally important: renewable-energy technology remains dependent on inputs from mining, a sector known for its grave social and environmental impacts. On 25 September 2015, the United Nations adopted a set of global sustainabledevelopment goals (SDGs) to end poverty, protect the planet and ensure prosperity for all. For Kenya, which co-chaired the UN Open Working Group for Sustainable Development, the goals are crucial for the wellbeing of the nation as a whole and particularly for its indigenous peoples. In its Vision 2030, it aspires to be “a globally competitive and prosperous nation with a high quality of life by 2030 through transforming itself into a newly industrialising, middleincome country that provides a high quality of life to all its citizens by 2030 in a clean and secure environment”. Both the SDGs and Kenya Vision 2030 clearly place humans at the centre of development, in line with Article 2 of the 1986 Declaration on the Right to Development. Kenya has accordingly scaled up its pursuit of investment in renewable energy. However, it appears questionable for the moment whether these renewable-energy projects will ensure the attainment of economic, social and cultural rights for indigenous peoples in Kenya, as guaranteed and provided by the International Covenant on Economic, Social and Cultural Rights, the African Charter on Human and Peoples’ Rights, the UN Declaration on the Rights of Indigenous Peoples and Kenya’s own constitution. But if communities lose lands and livelihoods in the process, who will receive the benefits of sustainable” development? Ikal Ang'elei is the director of Friends of Lake Turkana, a community association formed in 2008 in response to threats to the viability of the world's largest permanent desert lake in northwestern Kenya. She was awarded the Goldman Environmental Prize in 2012, in particular for her voicing of environmental implications of the Gilgel Gibe III Dam, speaking on behalf of Kenyan indigenous communities. 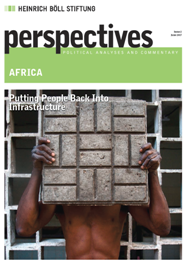 This article was sourced from Perspectives Issue #02/2017: Putting People Back Into Infrastructure.